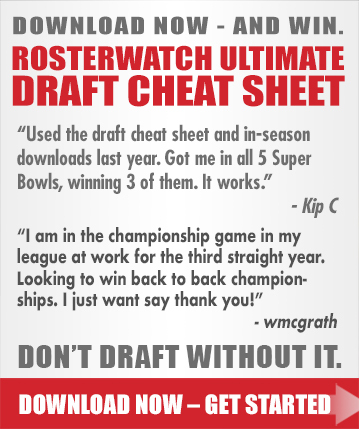 RosterWatch All-Senior Bowl Roster alumni since 2012 include: Doug Martin (Raiders), Marvin Jones (Lions), Melvin Ingram (Chargers), Kirk Cousins (Redskins), Janoris Jenkins (Giants), Lavonte David (Bucs), Kyle Long (Bears), Larry Warford (Saints), Eric Fisher (Chiefs), Brandon Williams (Ravens), Datone Jones (Cowboys), Desmond Trufant (Falcons), Robert Allford (Falcons), Jonathan Cyprien (Titans), Telvin Smith (Jaguars), Aaron Donald (Rams), Joel Bitonio (Browns), Derek Carr (Raiders), Deone Buccanon (Cardinals), Jordan Matthews (Eagles), Gabe Jackson (Raiders), Zack Martin (Cowboys), Aaron Colvin (Jaguars), La’El Collins (Cowboys), Phillip Dorsett (Patriots), Tyler Lockett (Seahawks), Laken Tomlinson (49ers), Danny Shelton (Patriots), Carson Wentz (Eagles), Deion Jones (Falcons), Malcolm Mitchell (Patriots), Sheldon Rankins (Saints), Kareem Hunt (Free Agent), Dalvin Tomlinson (Giants), O.J. Howard (Bucs), Cooper Kupp (Rams), Zay Jones (Bills), Dan Feeney (Chargers), Baker Mayfield (Browns), Will Hernandez (Giants), Uchenna Nwosu (Chargers) and Darius Leonard (Colts) among many, many other significant current NFL contributors. You can look back at previous All-Senior Bowl Rosters from the last seven years by searching “All-Senior Bowl” in the search navigation bar here on RosterWatch.com. 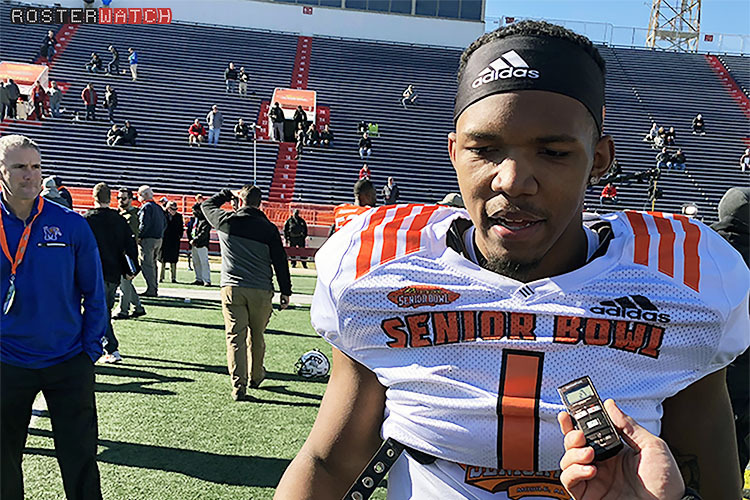 Congratulations to the 2019 RosterWatch All-Senior Bowl Roster, who, like the alumni listed above, most impressed our staff with not only their on-field skills, but also their off-field temperaments and personalities as professionals during the week of 2019 practices for the Reese’s Senior Bowl. Some of these players will have All-Pro NFL careers and we’re honored, as always, to have been in attendance for their introduction to the National Football League in Mobile. For the 2019 team, we have chosen to go with a “four-wide” 4 WR, 1 RB set for the offense excluding a tight end. As a reminder, these awards come out before the game is played and represent our evaluations from the week of practice, as this is the most important part of the week. How much do you think Sweats draft stock went up? Is it cockamamie for the Lions to take him in the 1st? Will he still be on the board for them in the 2nd? I cant see him lasting till round two but that is just a guess. I don’t really know what his draft stock was prior to this week. I think he’ll go in the Top 25, probably toward the end of the first round. He’s a little stiff around the edge, but wins in a ton of other ways, he’s going to be a first-round pick barring disastrous testing I think.